A trio of watercolors reveals Audubon’s decade-long struggle over this challenging characterization. 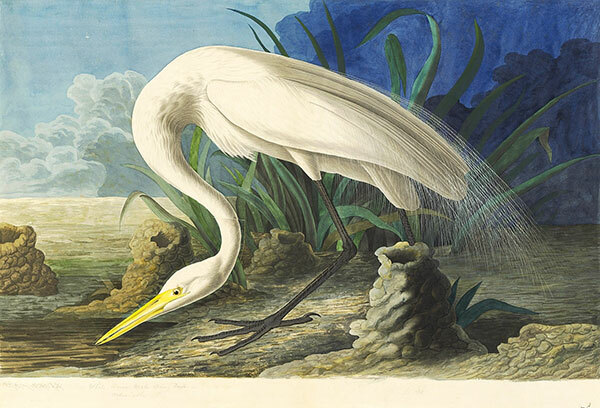 He confessed that the Great Egret was “the most dificult to Imitate of any Bird I have Yet undertaken.” In 1821 he painted his first attempt in New Orleans, the other two in 1831–32 in Charleston. All three feature males in breeding plumage. The artist’s initial vertical composition (Figure 1) places the bird against a nocturnal sky, preening his starkly white plumage. The second (Figure 2) is a horizontal composition that stresses the bird’s habitat and behavior with the mud chimneys of crayfish, its preferred food, but retains its backward-looking stance. JJA never finished this second version, turning instead to the third in which he drew the bird’s neck in an S-curve as it strides forward, plunging down to feed. 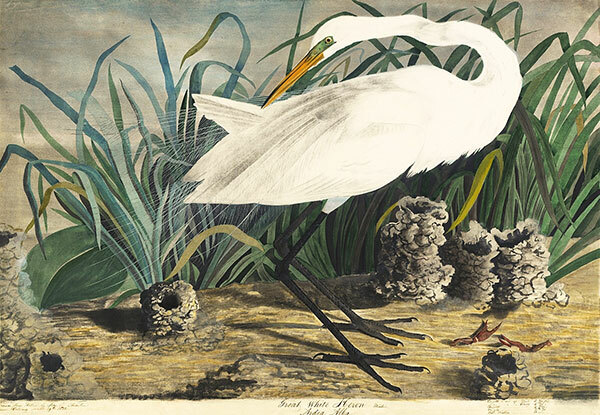 Still not pleased with the bird’s head, Audubon repainted the area on a collaged a piece of paper. Audubon left the water in front of the bird’s beak blank. He subsequently instructed Havell to engrave onto the copper plate in that area a horned lizard (Figure 3) from the watercolor 1863.17. 372 (Figure 4). 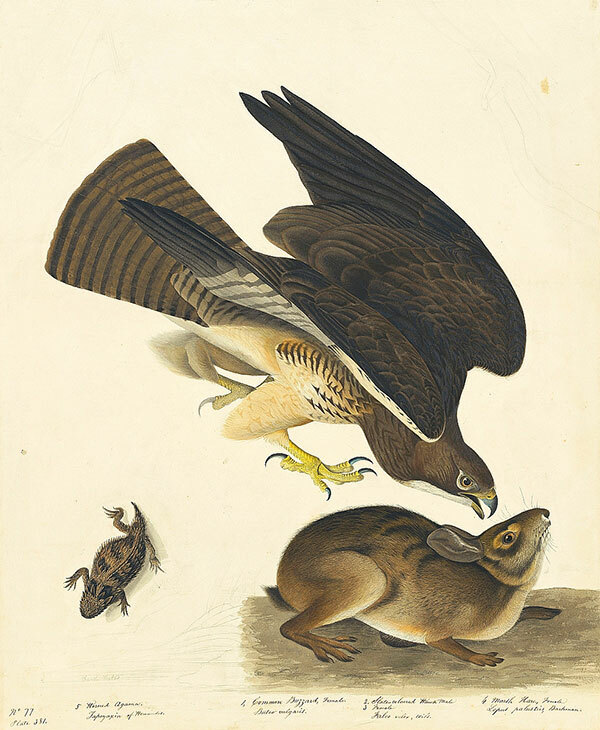 This desert animal―which Maria Martin may have painted―seems out of place in the wet environment of Havell plate 386. 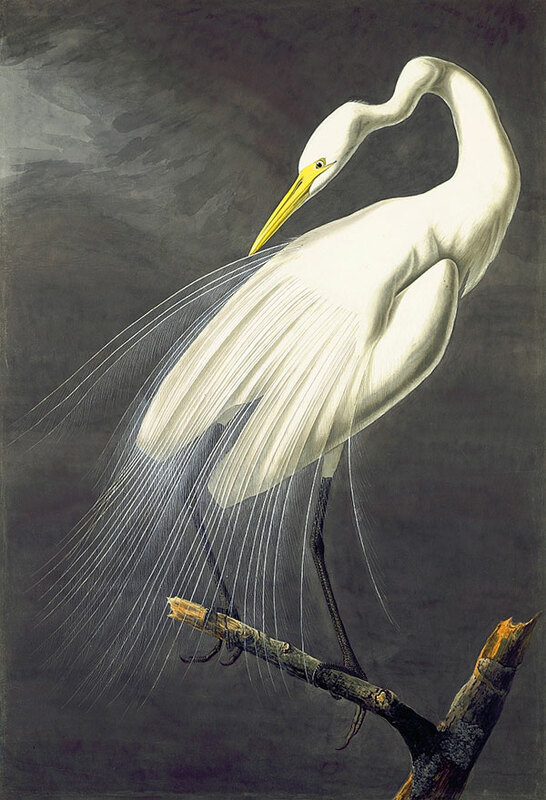 The sheer splendor of the bird’s plumage positioned the Great Egret on the edge of extinction by the early twentieth century. 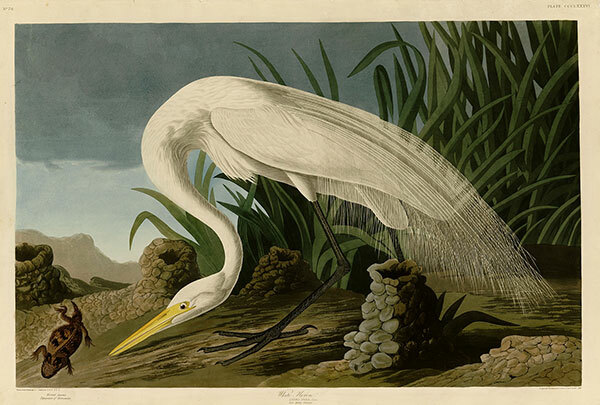 Presciently, Audubon worried that “the long plumes of this bird being in request for ornamental purposes, they are shot in great numbers while sitting on their eggs, or soon after the appearance of the young.” For example, in 1902 alone, about a ton and a half of Great Egret plumes were sold in London to decorate women’s hats, a quantity that must have required the slaughter of around two hundred thousand adult birds (and the destruction of two to three times that number of eggs). Through the efforts of the National Audubon Society (known as Audubon), which made it their symbol, the species is protected by conservation laws and has staged a comeback.